People in Montana love the outdoors. Our vast and dramatic landscapes humble us, inspire us, and support us. We live in them, work in them, and play in them. And whether we are running a backhoe or running a river, we share a direct and intimate connection with the land. The Trust for Public Land has been at the forefront of preserving the places that Montana communities care about most—that support our livelihoods and outdoor way of life. Working from regional offices in Bozeman, Montana, and Jackson, Wyoming, our conservation and park experts bring local knowledge and expertise to our "Parks for People" and "Our Land and Water" initiatives. Montana's Haskill Basin provides nearly 75 percent of the water supply for the town of Whitefish, located near Glacier National Park. Any development on 3,000 acres of the basin near the Whitefish Mountain Resort and Iron Horse golf community would put the town's water supply and rural character at risk. With the purchase of more than 310,000 acres of private forest land from the Plum Creek Timber Company, The Trust for Public Land helped to safeguard the future of the Crown of the Continent. We're bringing together neighbors, planners, and community groups to transform this historic landmark into a unique city park for hiking, biking, fishing, and exploring local history. On February 1, 2016, we lost our beloved friend and colleague, Alex Diekmann, to cancer at the untimely age of 52. Sportsmen, conservationists, civic and agency leaders, and friends from all across Montana are working together to honor his 100,000+-acre conservation legacy through the naming of Madison Valley’s unnamed peak # 9,765 in his memory. In 2005, The Trust for Public Land protected the 1,760-acre Anderson Ranch in Gallatin County. The Trust for Public Land and the U.S. Forest Service have successfully added 640 acres to the Lolo National Forest. The forest land, previously owned by Stimson Lumber Company, is a short drive east of Missoula near Beavertail Hill State Park. Outdoor enthusiasts of all kinds frequent the area and it is an extremely popular destination for both hunters and fishermen. The Crown of the Continent is the largest intact eco-system in the lower 48 states. To safeguard this unique habitat from fragmentation, The Trust for Public Land and its partners are working to consolidate “checkerboard” ownership patterns into an uninterrupted network of conserved lands. This 120-acre property within the boundaries of Glacier National Park has a colorful history. It was originally settled by Dan Doody, a prospector, outfitter, and one of the park's first rangers, who was later fired for excessive poaching of the park's wildlife. In 1987 The Trust for Public Land protected Garnet Ghost Town, Montana's best-preserved ghost town, offering a window into life at the end of the 19th century. The Gecho Ranch in the heart of the Madison Valley has 1,406 acres of grazing land, wildlife habitat, and is in an area that is considered one of the most ecologically intact corners of the Greater Yellowstone Ecosystem. The Trust for Public Land has been working in the Greater Yellowstone Ecosystem since 2001 and is focusing efforts on key landscapes within the area around Yellowstone National Park. In 2009, the Trust for Public Land secured a conservation easement on the Half Circle cattle ranch, permanently protecting the ranch from development. 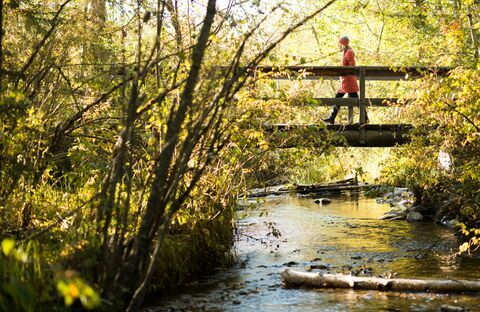 Nestled between the Gallagator Trail and Bozeman Creek, this peaceful, lush pocket park known as Ice House Park acts as a natural buffer for the popular trail, which is enjoyed by more than 50,000 visitors each year. Deep in the far northwest corner of Montana near the City of Troy sits 28,000 acres containing some of the state's best fisheries and wildlife habitat, and a highly productive working forest. The serenity of this pristine mountain lake captured the attention of Charles Lindbergh after his famous solo trans-Atlantic flight of 1927. Just 60 miles from Missoula to the south and Glacier National Park to the north, Lindbergh Lake offers visitors awe-inspiring views of the Mission and Swan Mountain Ranges. In 1986, The Trust for Public Land protected Little Big Horn, which sits at the center of the Crow Nation's 4 million acre reservation. In 2003, The Trust for Public Land protected a 475-acre parcel on the south slope Mount Sentinel, consolidating publicly owned land and creating a new link to the Pattee Canyon Recreation Area. Mountain Hi Ranch is located in Gallatin County, one of the fastest growing counties in the nation. In July 2017, The Trust for Public Land purchased a conservation easement on the 2,370-acre ranch, guaranteeing that a piece of Montana’s unique agricultural heritage is protected. The Trust for Public Land's O'Dell Creek Headwaters and Wetlands Restoration Project is a multi-year effort to restore one of the most significant wetlands complexes in Montana. In 2006, The Trust for Public Land placed a conservation easement over 1,521 acres of Olliffe ranch. In Montana, TPL's Parks for People program works with local communities to help them plan trail systems, design community parks, and protect nature close to home, offering opportunities for all residents to explore the great outdoors. In 2010, after some 10 years of negotiation, and with the help of The Trust for Public Land, nearly 1,500 acres of privately owned mining claims in the New World Mining District just outside Yellowstone National Park were protected. This past summer, in partnership with Montana Conservation Corps and the U.S. Forest Service, we hosted two AmeriCorps interns in Seeley Lake to complete a trails survey to help inform future trail efforts in the area. The Trust for Public Land, in partnership with the Montana Department of Fish, Wildlife & Parks (FWP) and Montana Department of Natural Resources & Conservation (DNRC), has added 7,018 acres of forestland to the Stillwater State Forest. Located between the Bob Marshall and Mission Mountain Wilderness Areas, the Swan Valley is one of the most ecologically diverse areas within the Crown of the Continent Ecosystem. Until recently, land ownership here formed a checkerboard pattern—one square mile sections alternating in private and public ownership. 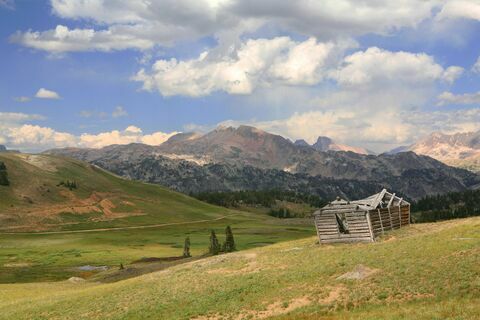 In July 2003, The Trust for Public Land completed protected close to 3,400 acres of checkerboard land in the famous Taylor Fork drainage, northwest of Yellowstone National Park. Protecting Olliffe Ranch in Madison Valley opened the opportunity for TPL to put Three Dollar Bridge—a near-legendary location for anglers—under permanent protection with direct public access. For generations, the land around Montana’s Trumbull Creek has provided forestry jobs for the local economy, clean water, critical fish and wildlife habitat, and recreation for residents and visitors, including hunting, fishing, cross country skiing, and hiking. Now those benefits are protected forever through a conservation easement that bars commercial and residential development while guaranteeing public access and preserving sustainable forestry.